The use of images is essential when it comes to social media – so it makes sense that a platform focused entirely on sharing images has quickly become an important part of the marketing mix. Since Facebook bought Instagram in 2012 its user numbers have skyrocketed to more than 400m a month, creating an enormous resource for all kinds of marketers. Since it’s English Tourism Week and Ad-Rank are big fans of travelling, we thought we’d take our inspiration for this week’s blog from English tourist boards, looking at how they’re using the platform and integrating it into successful social media campaigns (click on images to enlarge). This is one of the great things about Instagram – you don’t have to spend lots time and resources creating great content. On Instagram it’s already there, and users love to share it. Lots of English tourist boards (like Visit Kent, below) encourage users to generate content for them using competitions, the promise of regrams and the clever use of hashtags – all of which we’ll come on to later. Of course tourist boards do generate significant amounts of their own content, but often it won’t be as interesting or genuine as images and videos created by the public. Affection for a landmark, landscape or county can come across much more strongly when the camera’s in an amateur’s hands. That said, a common tactic within tourist board social media campaigns is to let either professional photographers or Instagram-savvy locals take over their account for a few days and document their travels. This creates content with more of a narrative than brand posts, and audiences respond to it very well. 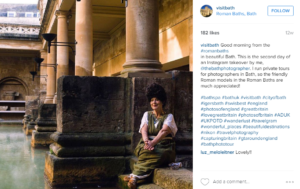 Visit Bath regularly use this strategy to generate a lot of excellent content, not just through images but also the accompanying text and the interactions they generate. There’s a real art behind an effective hashtag. Finding the right one to maximise your reach requires a real feel for social media. Twitter users will understand this – get your hashtag just right and you’ll see retweets you never thought possible. It’s the same with Instagram and there’s a constant battle to find hashtags that gain real traction. Visit Wiltshire has done very well with its branded #timeforwiltshire campaign, the success of which went towards their topping of the inaugural English Tourism Social Media Index. Tagging images with popular hashtags – Visit London recently tagged an image with #foodporn – can get content in front of new audiences and contribute to building follower numbers. Spotting trends and taking advantage of them is key, and clever social media marketers are always looking for the next thing to unexpectedly take Instagram by storm. The National Trust is one example of an organisation using competitions as part of their marketing strategy on Instagram. Using the hashtag #NTchallenge they get users to provide content for them, effectively turning followers and supporters into marketers. Setting a theme and sharing the best images tagged gets users engaged and builds on the National Trust’s brand, which comes across as friendly and inclusive. Visit Cornwall has also run a competition, the prize for which was a luxury stay with St Maws retreat. Rolling competitions, where the prize is simply your image being shared with large numbers of followers, are a great way of reaching out to users and creates a community of content-generators. Competitions with high-value prizes, on the other hand, are a good opportunity to combine social media with PR. 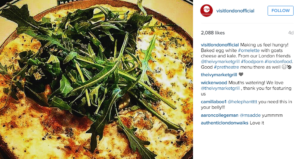 The kinds of calls to action used by tourist boards on Instagram are normally to do with using hashtags and the promise of a regram – something the average Instagram user really values, because it can boost their own follower numbers. Visit Cornwall says ‘use #loveCornwall and we’ll regram our favourites’ in its bio, while Visit Wiltshire has ‘tag #timeforWiltshire to give us permission to repost’ in its profile. Both are subtle CTAs with a great exchange – exposure for amateur photographers and the free generation of excellent content for the tourist boards. Instagram’s combination of being image-focussed and driven by hashtags makes it an ideal platform for marketers trying to drive tourists to their attractions. In spite of its popularity (it now has more users than Twitter), not all tourist boards have woken up to the power of Instagram yet – get with it, English Heritage – but we’re expecting this to change in the year ahead. With so many opportunities for travel marketers to share a wealth of beautiful images with a huge audience, how could they not get involved? Want to get use Instagram as part of your travel brand marketing mix, but not sure where to start? Get in touch and we’ll help you build an engaged audience of Instagram fans.